The UK’s financial regulators have been clear that the financial industry needs to change its culture. They have demanded that financial institutions reform their culture by establishing a new ‘tone from the top’, setting out objectives and values and reforming remuneration, risk management and governance systems. But when it comes to the regulators’ own culture – are they practising what they preach? New City Agenda’s report examines how the culture of the financial regulators contributed to the financial crisis. It assesses the actions taken by the UK’s financial regulators to change their culture. It identifies the progress which has been made and the barriers encountered. This year marks the 30th anniversary of the ‘Big Bang’ stockmarket reforms and the dawn of statutory financial services regulation through the passing of the 1986 Financial Services Act. The report reviews the past 300 years of history of UK financial regulation, drawing out the lessons for today. 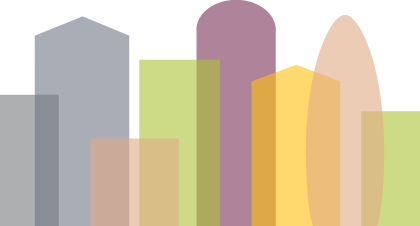 To gather information the team at New City Agenda and Cass business school interviewed current and former staff at the regulators together with stakeholders from large and small financial institutions, consumer and SME groups and regulatory experts. The report includes the reactions from staff at the regulators to the cultural change programmes and the perceptions of external stakeholders. no exception. Since the South Sea Bubble, politicians and regulators have been promising that next time it will be different. We are told the people at the top of the institutions responsible will be held accountable. This hasn’t happened. A deep seated culture of box-ticking had developed in the UK’s financial regulators. Instead of concentrating on the big issues, regulators spent valuable time adding ever more detailed rules and procedures and giving consumers ever more complicated information. This is likely to increase confusion and cost rather than establish clarity. The administrative cost of the regulators is now almost £1.2 billion a year – six times greater than in the year 2000. There are now over 13,000 pages of detailed rules and guidance from the PRA and the FCA. The FCA handbook costs £3,641, the same to buy as a second hand Mini Cooper. Complexity and box-ticking benefit lawyers and gives a veneer of reassurance, but it increases costs and makes regulations more difficult to understand and enforce and easier to manipulate or avoid. It also distorts competition. Big firms have armies of officials and a close relationship with the regulators to help navigate this complexity. Smaller firms and new entrants often find themselves reeling from the complexity, with only a call centre at the regulator to help them out. Unless we change the culture of regulators we will be sleep walking into the next financial crisis: This will have a devastating effect on our economy and our political system. Memories of the 2008 crisis are rapidly fading and industry lobbying has become more intense. There is a clear and present danger that we will repeat the mistakes of history. Much needed change is already being watered down. The attention of politicians has moved on. The vote to leave the European Union will mean that the UK will be in full control of its regulation, but it will also have signifi cant resource implications for regulators over the coming years. Regulators need to redouble their efforts to change their culture and move away from the bureaucratic and ineffective approaches of the past. 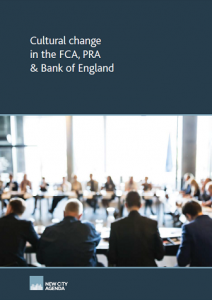 PRA and Bank of England have further to go to improve transparency and reduce group think: The Bank and the PRA have been trying to transform their culture with their ‘One Bank’ initiative. There have been improvements. But there is a risk the Bank and the PRA will slip back into being an opaque institution blighted by group think. It needs to engage with the public in a meaningful and sustained way. The odd talking shop is not enough. The Bank needs to actively engage with the public and consider the needs of society. More needs to be done to prevent group think. Bringing more external challenge into the Bank and the PRA would be a good start. The Bank and PRA are disagreeing with the views of Sir John Vickers that banks need to hold more capital because they have an unevidenced faith that their supervision can ensure that large complex banks do not ‘take excessive risks’. Andrew Bailey must implement a comprehensive programme of cultural change in the FCA: Previous attempts to reform the FCA have been blown off course. Leadership changes and the perception of political interference were in danger of making the FCA into a timid and cowed regulator. Cultural change at the FCA should be the primary aim and responsibility of the new CEO. Andrew Bailey will need to demonstrate independence from politicians and the industry. This will require establishing the key purpose and values of the regulator and the metrics used to judge its performance. It should also make changing the culture in financial firms its number one priority – it can’t franchise this job out to other bodies. The FCA should make greater use of its new powers to name and shame misleading adverts, obtain redress for consumers and take action against senior banking executives. It should take stronger action to promote competition rather than relying on re-writing the information given to consumers. Finally, it should set up an independent evaluation office within the regulator, as has been done by the Bank of England, to ensure that it learns from the mistakes and successes of the past. Politicians should support cultural change and tackle the culture of secrecy in UK regulators: Politicians influence the culture of the regulators through the framework they set, the statements they make and the people they appoint. Politicians have implemented a legislative framework which supports a culture of secrecy within regulators and damages accountability. It means that the FCA can negotiate secret agreements with banks and then refuse to disclose them. By restricting access to information the culture of secrecy also damages the ability of the National Audit Office and others to properly evaluate the regulators’ impact. Politicians must reform the legislation so regulators are transparent and can be held accountable. They must also appoint diverse leadership and board members.